“The first time i saw you across the room. I felt like the cherry blossoms were in bloom”. In collaboration with old friends is really great for me especially the one and only editorial photographer Robin Alfian, because I no longer need to feel awkward during photoshoot. The first impression when I entered the studio is the decorations made me longing for the land of cherry blossom. I kinda love oriental makeup and updo hair, especially the bangs! Steve Yeofvine makes me look perfect. 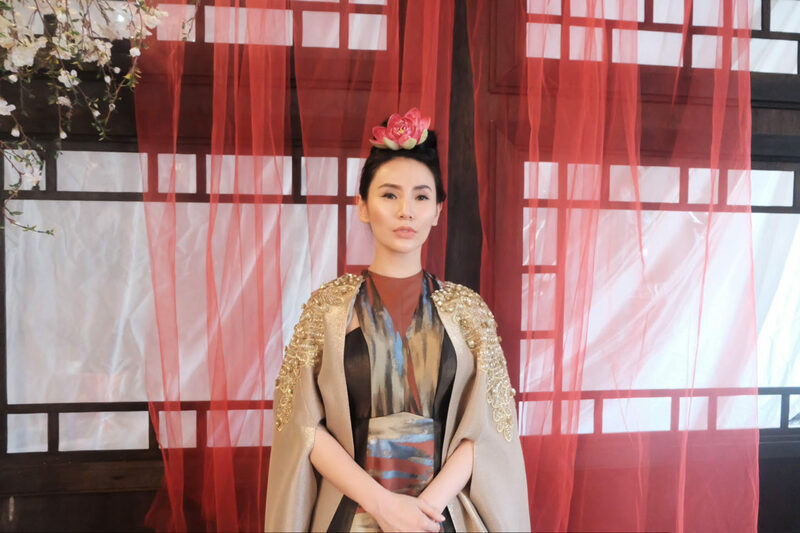 Oriental theme is really exquisite with a variety of accessories and headpiece, that support the concept under Steve Yeofvine, he is a runway makeup artist. But before photoshoot, Raditya Bramantya shoot me with his lens for Q and A video. Not only happy reunited with Robin and Steve, I’m so happy with all outfits from fashion stylist, Willy. I love to wears beautiful day dreamy dress from Priyo Oktaviano, dripping in gold from Andreas Odang, and also prettiest print long dress from Albert Yanuar. Can’t wait to see the result only on L’Coiffure volume 3!